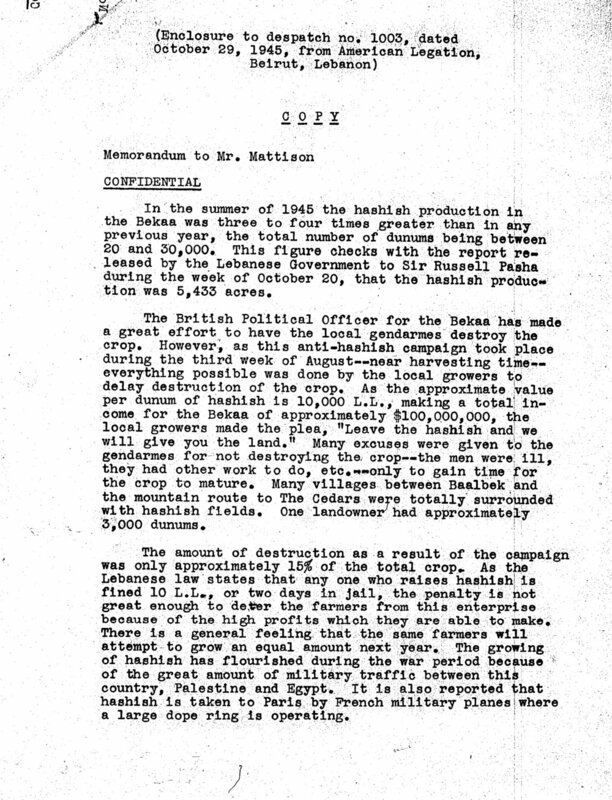 I am compiling an edited volume that will explore declassified documents from the State Department in Lebanon from 1930-1962, which will be realized as an edited volume or interactive website in Spring 2019. I will work with 30 (+/-) documents, of particular importance and oddity, which will be reproduced in their entirety (3/4 pages) and paired with commissioned contributions from academics and artists whose work aligns with aspect of this document, historical moment, or series of issues. This marriage of document + “open-ended contextualization" by scholars/artists is a chance to start conversations, view what was once hidden through classified material (then buried in archives), and think through the craft of various eras of state-making. I am keenly interested in forming a larger conversation with colleagues beyond the confines of peer-review, in a more playful and open-ended manner. I am currently assembling the documents and will soon reach out to proposed contributors. Below are sample documents that would each be paired with an essay/intervention (4/5 pages). These documents serve as provocations to the contributor in which she might choose to contextualize, historicize, or draw connections to contemporary issues in the Levant.